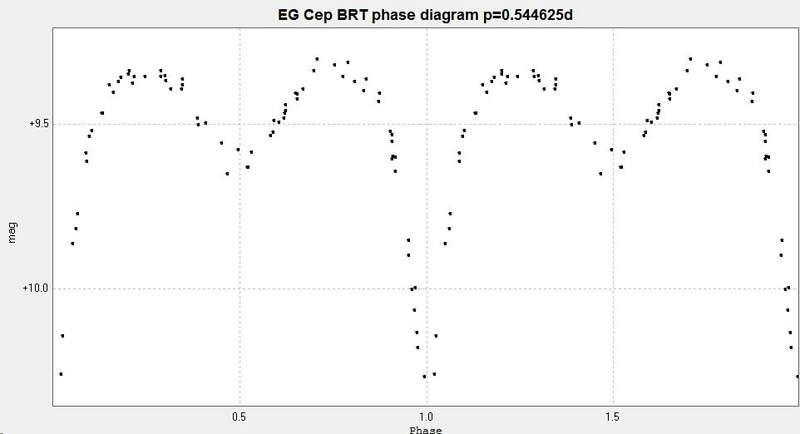 Light curves and phase diagrams of the EB type eclipsing binary EG Cephei / EG Cep. 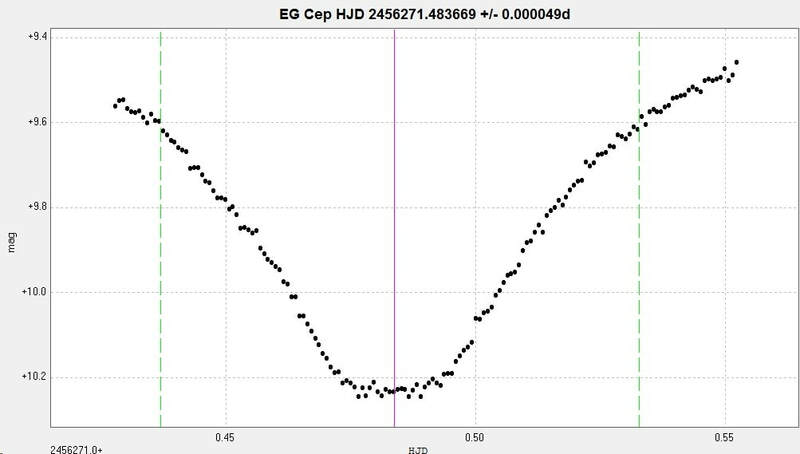 Light curve of EG Cep generated from 74 images taken with the Bradford Robotic Telescope Cluster Camera (BRT) between 2014 Aug 08 to 2015 Nov 11 through its tri-colour green filter. ​When plotted with a period of 0.544625 days the following phase diagram is generated. 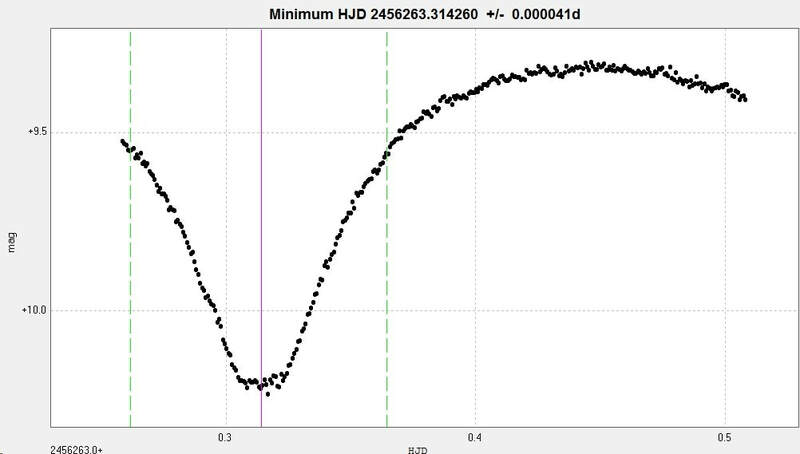 A secondary minimum was observed with the 2" Titan at Somerby Observatory, unfiltered, on 9 February 2018. 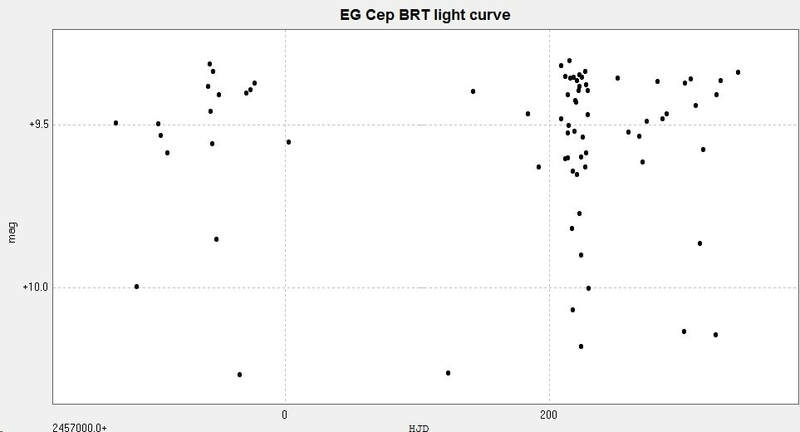 Combining the BRT data with the primary minimum of 1 December 2012 and the secondary minimum of 9 February 2018 generates the following light curve and phase diagram. 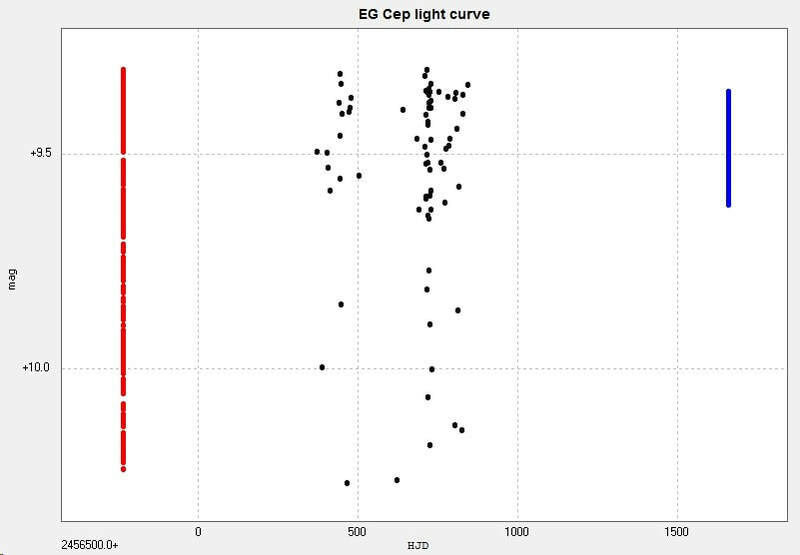 The BRT data is in black, the primary minimum is in red and the secondary minimum is in blue. I have observed this star visually a number of times with my 10" Newtonian. The following are the three 'best' minima observations. 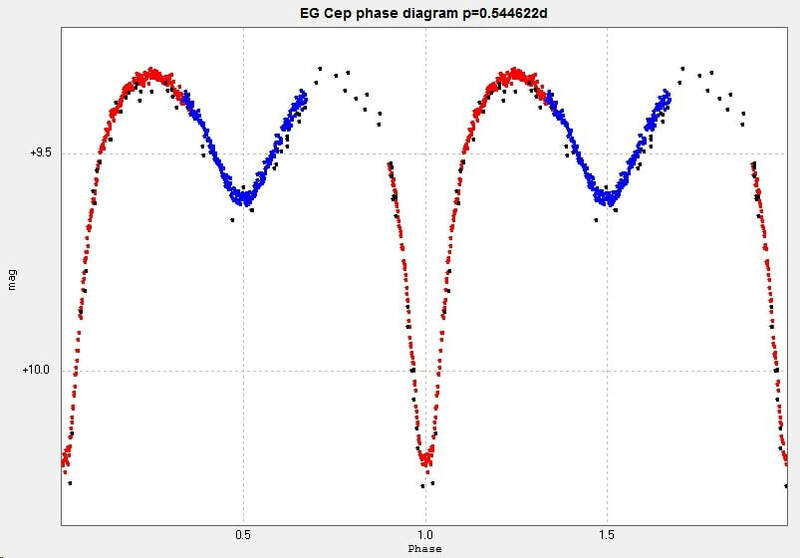 ​Combining these results in the following light curve and phase diagram. 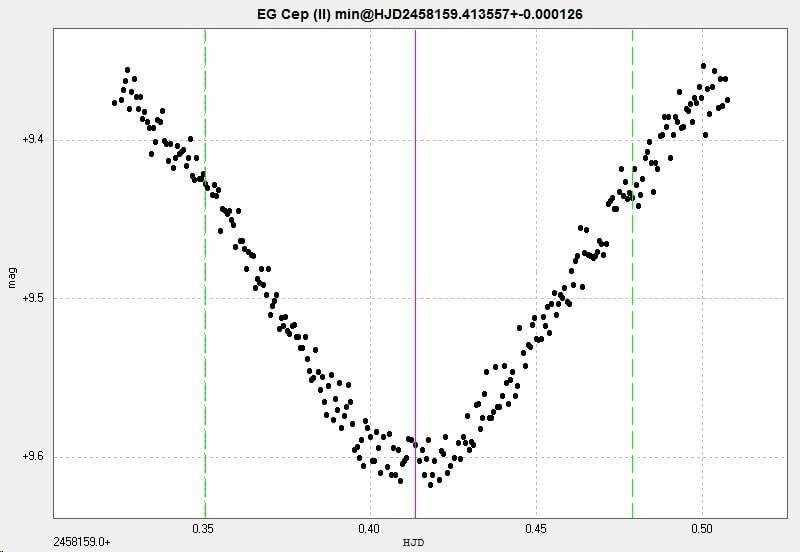 The catalogue values for the period of this system are 0.54462183d (GCVS and AAVSO VSX) and ​0.54462150d (Kreiner) (accessed 2017 Feb 23). These values are within 0.13 seconds of my estimates; there is some o-c activity for this system (Kreiner).